When companies like Roche, GE Medical and Merck are in the market for high-end steel baskets and containers for their factories, they turn to Marlin Steel Wire Products. The Baltimore-based firm of 29 people has been around for about 50 years and for the last 17 has focused on producing quality metal parts for customers in 39 countries for whom customization and exact specifications are important. “We’re trying to cater to a market that’s focused on quality, on engineering, customization and quick delivery,” says CEO Drew Greenblatt. The acquisition of Marlin Steel seemed like a no-brainer, given the company’s ability to churn out steel wire bagel baskets at about $12 apiece. Revenue stood at under $1 million, allowing for a slim profit and the possibility of growth from the increasing popularity of bagels. 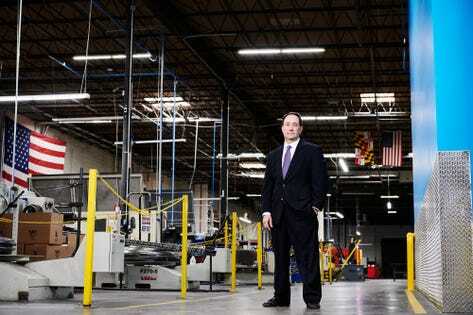 But within a year, outside forces began to unravel Greenblatt’s plans for his company. Chinese manufacturers of similar products began shipping to U.S.-based retailers in Marlin Steel’s markets, charging about $6 per basket. “This was unbelievably disruptive,” Greenblatt says. At the same time, a low-carb mania had seized the nation, further putting a dent in bagel sales. “America’s ever-increasing desire for bagels came spiraling down.” And as bagel shops began to go under, survivors sought to cut costs by buying metal baskets from cheaper sources. By 2001, Marlin Steel was hemorrhaging cash when it received a small order for 24 high-end custom steel baskets from an engineer at Boeing who seemed unconcerned about paying the relatively high price of $25 per unit. “That was when the lightbulb went off,” Greenblatt remembers. “I’m focused on the wrong area.” The path forward, he figured, was to offer high-end steel baskets and parts that could be shipped quickly to engineering clients. Reconfiguring Marlin Steel to meet the demands of its new market meant raising the bar in terms of quality, making items that met precision measurements and specifications suitable for manufacturing. Previously, workers would hand-bend products into shape. But increased precision required machine bending and the use of automated manufacturing, and today the firm employs robots to help with production. Just weeks left to submit nominations for the 2019 ForbesSmallGiants list! Nominations close Jan. 31, 2019. Please submit using the application here.